Would love to do this one. Sounds like fun. I'm ready for at least 6 more. Have fun with your challenge! Glad you're hosting again! I'm ready for another round. I'm in! I love Animal Cozies. Thanks for hosting again! LOVE IT! Thanks for hosting.This is going to be my first year doing reading challenges with themes,I so excited! Thanks for hosting,I excited to join the challenge. I wish I'd known about this challenge earlier - I surely would have joined! Anyway, I am delighted to sign up for this - it's actually the first 2013 challenge I've signed up for! this is the first time I join this challenge!! I love it!! Thanks for hosting! I'm joining several of the challenges you listed. This is my first time to do any reading challenge & I'm excited! This challenge runs from January 1 to December 31, 2013. The previous challenge (What An Animal V) ends in February. This is the post to sign up for What An Animal VI. Yvonne, I made an error in #159. Would you please change the title to "Avenging Angels" (Riedel Fascination)? I already know of several books I will be reading for this. Also, is there a button for this challenge? Yes, you can use the one at the top of the post. Just added One Hot Murder which has a cat on the cover. Darn it! Posted my latest review on the wrong linky...Sally's in the Alley should NOT be on the initial sign-up link. Sorry! I just posted a link to where my beginning and ending post about this challenge is. I will be reading more books with cats do to joining the cat mystery yahoo group. All done! 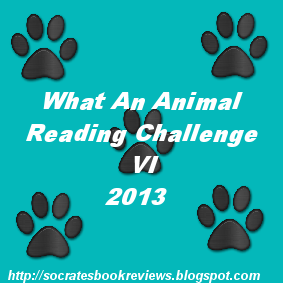 I'll be reading more books with animals though...so I'll still be linking up reviews. I excited to join the challenge! I'm nearly done typing away on poor old dial-up. (I for one don't look forward to filling in 'Mount TBR' but it's mercifully the last long one of 2013). For challenges running in the Jan-Dec traffic: God bless all of you who leave the link long enough! When you get around to my closing post, would you leave a note about where I go to correct linky information? Good to know if it's in Wordpress menus, or where on Earth. I'm a complete hosting newbie. Thank you!